During this pool inspection in 4S Ranch, the buyer had many questions. Due to them never owning a swimming pool, let alone a saltwater chlorine swimming pool. This 4S Ranch pool is in very good condition and during the pool inspection, there was nothing really wrong. This is very abnormal though it is always nice to see a pool that was not in need of pool equipment repair or pool equipment upgrades. That is not right away, though in time they will need to upgrade the pool pump to an energy efficient pool pump. During the pool inspection and orientation, the home buyer was very curious about this 4S Ranch pool service requirements. Once we were done explaining the condition of the pool equipment and discussing future pool equipment upgrades they were most interested in the pool maintenance. The information below will give an outline of the recommended pool cleaning and service requirements along with a description of the condition and pool equipment upgrade recommendations. 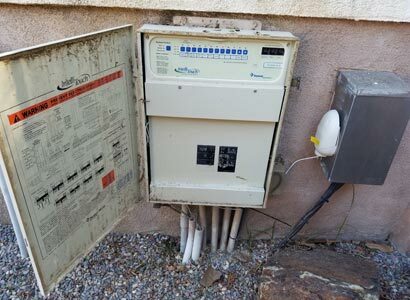 The pool heater at this home in 4S Ranch, San Diego, CA is a Sta-Rite Max-E-Therm pool heater. Sta-Rite now owned by Pentair, still makes the Maxi-Therm and the like Pentair MasterTemp pool heater. These pool heaters are non-atmospheric and that means the heat chamber is vented using a blower. Unlike the Raypak pool heater that is atmospheric due to it vents naturally. When performing the pool inspection, we turn on and run the pool heater to ensure it is working. If not, we explain in detail what pool heater repairs or pool heater replacement is necessary based on age and overall condition. When testing this pool heater, it was in good working condition for its age. A saltwater chlorine system can be a great addition to a swimming pool as long as they are taken care of and that you are receiving proper weekly pool service. That means not just having a clean pool but, that the water’s chemistry needs to be correct or you can cause severe damage to a swimming pool surface. When having a salt water pool in 4S ranch or any other area of San Diego, you need to keep the correct pH and alkalinity. If not, you may encounter scaling which is a rough buildup to occur on the pool or spa surface. 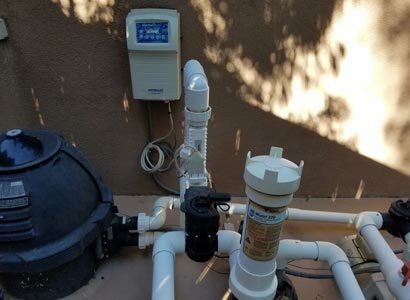 The salt water chlorinator at this home is an AutoPilot Pool Pilot. It is in working condition though we would not choose this brand or model. When installing new saltwater chlorinators, we will go with either the Pentair IntelliChlor salt system, the Pentair iChlor salt chlorine generator, or the Jandy TruClear salt water chlorinator. As with all saltwater systems, you will need to clean the salt cell every 3-4 months and possibly check monthly to determine calcium build up. The type of pool automation installed at this 4S Ranch home is the top of the line. It is a Pentair IntelliTouch controller that gives the homeowner many options for functionality. This pool automation system also has a wireless adapter allowing the use of a wireless remote controller. By having a Pentair IntelliTouch, you allow your pool automation the ability to operate additional features. These features can include an outdoor sound system, additional landscape lighting and much more. By having this pool control system at this 4S Ranch home also allows you to have smartphone or tablet control. You will simply require a screen logic upgrade and of course a smartphone or tablet. Having this gives you the ability to turn things on from home or on the road. A Sta-Rite pool pump is being used for pool filtration and Pentair pool pumps run the water features and spa jets. Both types of pool pumps are now manufactured by Pentair and are pretty much the same. These pool pumps at this 4S Ranch home are all single speed pool pumps. This means they all run at full capacity when on, which means they are not the most efficient. Granted you would most likely keep single speed pool pumps for the water features and spa jets but not for the main filter pump. The main pool pump should be a variable speed, energy efficient, smart pump. These smart pumps that are variable speed allow you to run the pool at the most efficient speed possible to save money on your electricity. So when upgrading your pool pump or replacing an old non-working pool pump, go with a variable speed. There is also a law in the State of California called the “Title 20 law” that states any pool pump larger than a 3/4hp rated (actual 1/2hp pump) will need to be a variable speed, energy efficient pool pump. 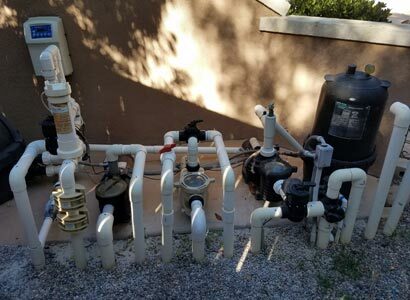 At the time of the pool inspection at this 4S Ranch home, all three of the single speed pool pumps were in good working condition. There is a smaller cartridge pool filter in this 4S Ranch swimming pool. It is the right type, as a cartridge filter is what we recommend. This filter at the time of the pool inspection was working good and had no visible leaks. Due to the fact that the filter is working does not mean it is the best filter for the swimming pool. 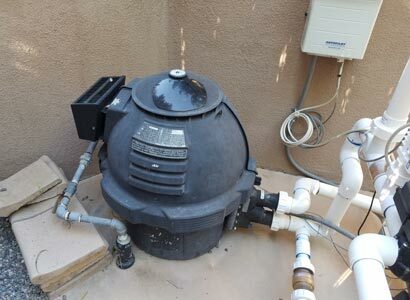 Because it is a smaller pool filter, it will require a pool filter clean more often. This is due to the amount of filtering this type of filter can do before getting clogged up. Based on the size of the pool pump and the 4S ranch swimming pool, we would recommend installing a new pool filter when any pool filter repairs are necessary. When replacing the pool filter, we would recommend a Pentair Clean And Clear 420sq ft pool filter. This will allow for a cleaner swimming pool and longer intervals between pool filter cleans. This swimming pool in 4S Ranch is a plaster swimming pool. It also looks to have an aggregate upgrade. The pool coping is a common safety grip coping that matches the San Diego Buff color of the pool deck. They have a nice clean neutral colored ceramic pool tile with some natural rocks set in the deck and water spouts and water feature. The water spouts shootout over the deep end crossing each other and they are right in front of the waterfall feature. All in all this 4S Ranch swimming pool is in really good condition. And the only thing that needed to be done before the rainy season is the expansion joint. That is the rubbery material that helps with expansion and contraction of the pool. With this pool in 4S Ranch, it will require professional, and thorough weekly pool service. Weekly pool service because of the salt water chlorine system. Due to this being a saltwater swimming pool, the water chemistry will rapidly change daily due to the production of the chlorine. Saltwater chlorinators produce a high pH, chlorine that will affect the water chemistry. If the water chemistry is not balanced at least every week, you will encounter issues with the swimming pool. As the chlorine is being produced, the pH is rising. When this happens and the pH goes out of range, it can produce a scaling effect on the pool’s surface and tile. You can often see signs of this with the white line that runs around the tile of most swimming pools. Yes, a portion of that is normal though it is usually a lot worse as the pH is not being properly adjusted. Unfortunately, for most swimming pools in 4S Ranch or San Diego in general only get a weekly or bi-weekly pool service. Even this allows for the pH to rise above the recommended level and that is why it is important to clean and balance the pool water chemistry every week. As a company, we only provide a complete weekly pool service as we do not want to maintain a swimming pool improperly. We do understand that it is sometimes an extra cost to have a weekly pool cleaning service though, over time the possible damage may cost you much, much more. If you are buying a house with a swimming pool or already own a home with one, we can help. We offer new home buyer pool inspections, weekly pool service, pool equipment repairs and new pool equipment upgrades for all of 4S Ranch and San Diego County. If you have any questions or concerns about your swimming pool or just want to schedule a service, give us a call or fill out our contact form.